Today is Super Smash Bros. Ultimate’s big release day. People in Japan are definitely keen to get the game. 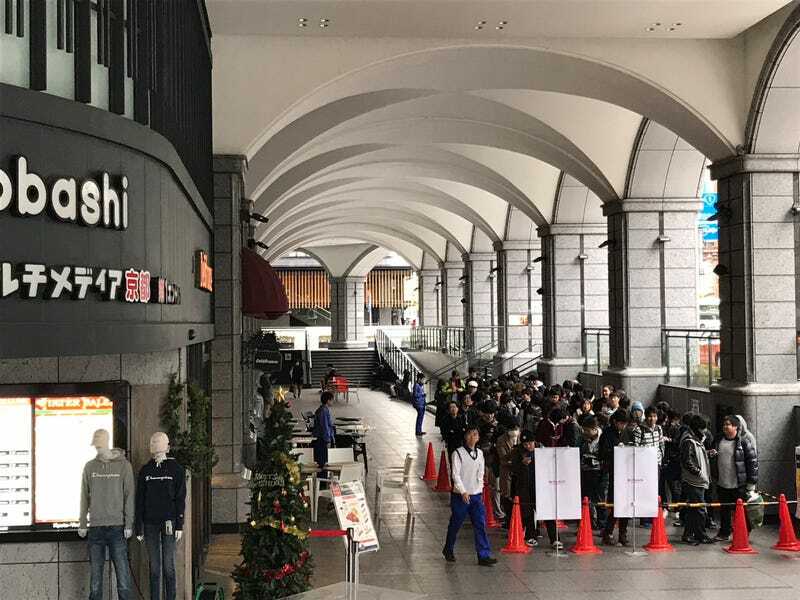 Interestingly, there were also lines were for the newest Pokémon card expansion set. At the Akiba Yodobashi Camera in Tokyo, one of the biggest electronics shops in the country, there were around 20 people at 6:00 am. That’s not many considering how much business that store does. Still, don’t read too much into that. Website Inside Games visited the Akiba Yodobashi Camera in Tokyo at around 9:00 am this morning and asked those at the front what they waiting to buy. The reply was the new Pokémon Card set. That reply was common among those waiting. Today the latest expansion, Tag Bolt, for the Pokémon Sun & Moon card game was released in Japan. Earlier this fall, Kotaku reported how Pokémon expansion card set Super-Burst Impact sold out at launch. The cards are experiencing a new surge in popularity with older players who grew up with the analog game. People were most certainly waiting for Smash Bros. Below are photos of the Yodobashi Camera in Shinjuku. At the Yodobashi Camera in Kyoto (above), there appear to be separate lines for Smash and Pokémon. Watch Cheesemeister’s live stream of the Kyoto launch right here. In the past, retail lines were a good indicator of a game’s popularity. It’s increasingly difficult to judge game releases by looking at lines. Shorter software lines are no longer a sign of lacking popularity. At some places, the Sun & Moon Tag Bolt expansion set boxes were one per person, and the Premium Trainer box was in such high demand that customers had to enter into raffles for a chance to buy. As Inside Games pointed out, it seems as though folks who want to play Super Smash Bros. Ultimate right at release buy the digital version instead of lining up for hours at retail. One customer, however, said he had a preorder but was so excited to play, he waited in line regardless. Since Pokémon cards are tangible retail products, fans have no choice but to wait.